We Drink Your Milkshake! : RUBBER Review- Or How A Bunch Of Loud D-Bags Could've Ruined Jonesy's Birthday, But The Texas Theatre Was Awesome And Took Care Of It. RUBBER Review- Or How A Bunch Of Loud D-Bags Could've Ruined Jonesy's Birthday, But The Texas Theatre Was Awesome And Took Care Of It. So one of the venues that we wanted to go back to ever since DIFF was the Texas Theatre. It is a historically important and really classy venue in the Dallas area. I won't go into a history lesson here, but here's a link to their page to read up on them. 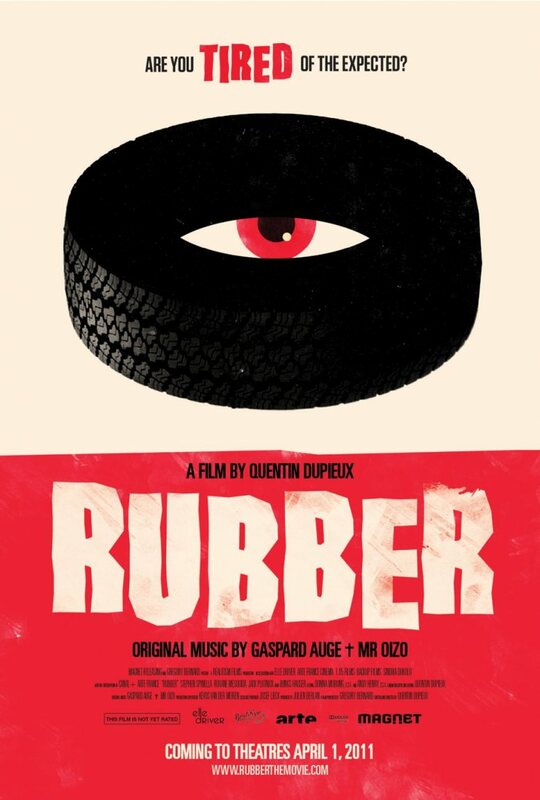 Anyway, as part of Jonesy's birthday extravaganza, we went to the 5:30 showing of RUBBER, a very hyped and unique movie about a killer tire. RUBBER is everything you could have hoped for and more. The opening monologue is sheer brilliance as is the first 30 minutes of the movie where young Robert, the tire, learns to be sentient and telepathic all the while developing a crush on a girl. Novelty aside, how does this movie hold up? Pretty well actually. The writing and the sound design are two highlights in this movie. From the aforementioned opening, the movie belongs to the clever and witty dialogue. I'm sure someone might call it B-movie dialogue, but it's too self-aware to be bad. For all of the praise for its writing and acting, I am so utterly impressed at the great sound design of this movie. During the times that the movie just focuses on Robert and he learns to be psychic, I could feel the desert winds, and I could feel the vibrations coming from the tire making my head about to explode. Honestly, I don't feel I can talk about this movie without spoiling anything or perfectly duplicating the great images going on screen. There are some issues with the movie of course, such as a sometimes-confusing meta element to the movie that comes out of nowhere and is never fully explained. Or the fact that it has a pretty dreadful second act, with the running times being a mere 85 minutes, it still felt a little long at times. Regardless, this movie is something one that if you're even remotely interested in seeing, you should see it. You know what you're getting, comedy, gore, and just a silly premise that exists for no reason. Now, this review is a bit shorter than usual because I wanted to talk about the inconsiderate drunk assholes that almost ruined the movie for us. They kept on yelling, talking, and laughing during the most inappropriate times. There were several times that someone told them to shut up, and one time we were under the impression that an employee had told them to be quiet; however, such was not the case. If I hadn't been in the presence of friends and birthday girl, I would've been potentially a lot ruder. When the movie was over, we chatted about it on the Twitter. Within a couple of hours of the incident happening and us going along with the rest of the birthday celebration, the person who runs the Theatre's Twitter account contacted us and apologized. Apparently, if they had been made aware of the situation, they would have kicked those dicks out. They apologized and were super helpful about the situation, even offering us free tickets for the next showing. I loved the fact that within hours of this incident, over the Texas Theater Facebook page, they posted a note about the incident. I am so glad that the Theater reacted the way they did, between AMC, Studio Movie Grill, and The Inwood, it seems that the theaters that are safe for respectful movie goers are dwindling in Dallas. What boggles my mind is that there are people that think that it is okay to act this way. This is one of the most ridiculous forms of selfishness I know of. You're ruining an experience that paid good movie. Is it really that hard for people to shut up and not text for 90 minutes? Then again the fact that a member of an unidentified press organization narrated DAYDREAM NATION to herself during this year's DIFF, it really makes me wonder what the hell is going with people's common sense. If you're going to be loud or drunk or both, why on earth would you want to go to a movie? It's experiences like this that have kept me from enjoying movies in the theaters the last few months. If Jonesy and I are not at a press screening, then I will try to go to a matinee to avoid as many people as possible so my movie experience isn't completely ruined. As I have talked with many Twitter friends, and the Midnight Madness movies at the Inwood have become a hell for a quiet moviegoer, with the THE ROOM screenings almost certainly being to blame for setting the precedent of super loud shouting. Even with this dire state of affairs in Dallas movie theaters, I'm glad that even though it's far from where we live, The Texas Theater will keep their promise and maintain a a classy environment for us that appreciate silence during our movies.